Join the game and feel like a Wolves player! See the latest video showing the essence of cooperation between CoinDeal and English Premier League Club Wolverhampton Wanderers! Contrary to appearances, the world of cryptocurrencies and football go great with each other. In both cases, solid cooperation, fair play and the ability to react quickly and make quick decisions are important. This correspondent dynamics and CoinDeal's founders passion for football caused that as the world's first cryptocurrency exchange we decided to become the official sponsor of the English Premier League team - Wolverhampton Wanderers. We are extremely proud of this step! Our cooperation with the popular Wolves is very successful, it also abounds in charity campaigns. - We were able to support the Polish football club Wilki Różana, which clothes and sports equipment were stolen. 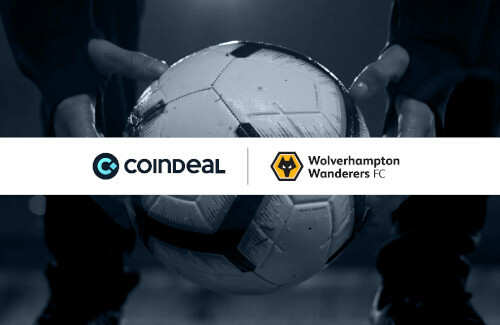 Through CoinDeal, they received new match sets from Wolverhampton Wanderers FC. - At the beginning of the year, we donated an official jersey with the signatures of the players for auction via the Great Orchestra of Christmas Charity and thanks to this we collected 2,137 PLN for children's hospitals. - During our cooperation, which started in July 2018, we also distributed almost 60 tickets for matches at Molineux stadium for CoinDeal users and Wolves fans. Just like in football, as in business, it is very important to have a harmonious, efficient team that is characterized by dynamics and flexibility. In the film we created, in addition to well-known Wolves players: Conor Coady, Diogo Jota, Ruben Neves, Raul Jimenez, Willis Norris and Ryan Bennett, the best Polish freestyle players specializing in football tricks. The old, atmospheric halls of Stary Browar Piastowski in Wrocław (The Old Brewery) served as a filmset. Then, production moved to Wolverhampton and more specifically, Molineux stadium. We were looking for a combination of two worlds. We have found a common ground of values connecting us and Wolves. These two seemingly incompatible worlds have a lot in common. Both in the crypto and on the football field, there is competition and the need to make quick and accurate decisions – because unlike the traditional crypto platforms, changes in the world of cryptocurrencies are not a matter of days, not even hours, but minutes.